From Jan. 1 of this year through this morning, June 16, we have had 129 disinvestment events occur, an average of 5.4 per week (see chart above). See related news story here. I'm a little surprised that Arizona is #2. It's taxes are better than California's, and it is right next door, but it's dead last in tax policy compared to the others. It has the highest combined state and local sales tax (#3 in the nation IIRC) and it has a progressive personal income tax that isn't indexed for inflation. Yeah, well, they are losing the industrial base but they will still have millions and millions of people "doing the jobs other people dont want to do." We oughta just divide the U.S. into two countries: the "red states" and the "blue states". Only question is how to divide up all the debt and unfunded liabilities. What exactly does the Brown administration think of this (not the public tripe), if they think of it at all? Is it a priority? What do they believe is the solution if there needs to be one? Second, Californians just elected more of the same. Is there any general tendency by the populace to tie policy to these events at all? My general impression of Whitman's election run was that it was far too clean. She should have been starkly painting the picture of John Galt syndrome. That is still my impression. The lefties keep forgetting that in the real world incentives do matter. I wonder if this will cause the cost of living here to decline since with fewer jobs you have fewer people to pay the high costs of buying a house or renting in much of this state. "I wonder if this will cause the cost of living here to decline since with fewer jobs you have fewer people to pay the high costs of buying a house or renting in much of this state." You have answered your own question. With fewer people, the price of buying or renting a house will decline. "The lefties keep forgetting that in the real world incentives do matter." I don't know if it's a matter of forgetting, lefties have never thought incentives matter. Michigan changed its tax law this year so that many (most?) retirees will have to pay income tax. The old law exempted from income tax all pension income for retired state workers and the first $80k (or so) for other retirees. A comment I often read in the Detroit News blogs from current retirees upset with the new law is "... well, I'll just move to a state where I don't have to pay income tax, like Florida." These same people then seem to be surprised when companies do the same thing. Apparently these people who are opposed to higher taxes for themselves (higher taxes being OK for "other" people) believe that companies will just stand in the middle of the road and let themselves be ran over by higher taxes, byzantine regulations, and hostile unions. At least in California, if you own a business you can leave. In Washington state, even that may not be true (at least for Boeing). People have to look at the whole picture. What you save in income taxes leaving Michigan can easily be spent on hurricane insurance in Florida. But then you get to live in Florida. "People have to look at the whole picture. What you save in income taxes leaving Michigan can easily be spent on hurricane insurance in Florida." But that's OK, as it's a government insurance program that you help pay for, and I can rebuild my damaged house over and over without penalty. That may not be true. Boeing can always spin off its civilian aircraft side and move operations abroad. I am sure companies like CAC, SAC, SAIC, and XAC would be happy to build manufacturing and assembly facilities that can handle the work. They certainly have the trained workforce to do many of the jobs and are capable of adding to the order book thanks to their AVIC links. Why not New Mexico? Belize? Panama? Cyprus? There are many places where a retiree with a little bit of fixed income can retire that are much better off than Michigan. The sad thing is, California has so many natural advantages, and so much momentum from the past Golden Age, that among 50 states, even if it ranked in the 30s, no one would leave. The fact that it is ranked in the bottom 3 states is what causes the exodus. It does not have to be as business-friendly as Nevada. It just has to be 'not too extreme' to still survive on its vast advantages. Killing the goose that laid the golden eggs - modern version. Remember that California voted Republican in Presidential elections as recently as 1988. Yes, it was a Red State until 1988. 2) Import millions of unskilled, illegal workers from countries more friendly to hard leftism. 3) Use steps 1) and 2) to increase taxes. As goes California, so goes America, for better or for worse. The IPO of Facebook will restore California fiscal solvency for another 3 years. After that, shale oil discovery off of Monterrey will cause another boost. Sadly, each such windfall causes them to double down on big government, rather than see that as a 'Get out of Jail Free Card' that it is. As someone who's lived and worked in both states, I would miss the climate in San Diego but would love the freedom and lower costs in Florida. Honestly, the schools are terrible in both places but I'd have to put the Palm Beach schools our kids went to above San Diego's. I have a close personal friend who sold his company in California 4 years ago for just under $1 million. He used the money to seed another company he is starting in Texas. He just landed a $60 million contract, of which California will get $0. That is what over-regulation did for California is this one guy's case. 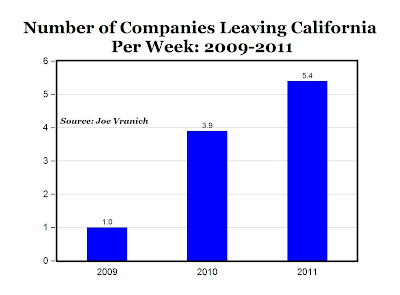 And the beneficiary of the California boy leaving to start his new company? Texas, and Texas workers who will be employed at his factory in Texas. I'm a native Californian, and I loved it. But after a year or so in the Bay Area, Uncle Sam sent me to Texas, and I felt like I'd taken off a pair of too tight boots I'd been wearing for years. That was 30 years ago, and I have no desire to move back. Look on the bright side: At least California will finally have an incentive to build a border fence... albeit to keep people from leaving. "I don't know if it's a matter of forgetting, lefties have never thought incentives matter. " ....... that's bs ....... lefties totally believe in incentive, what do you s'pose subsidies for green energy & ethanol & community organization represent. Lefties simply believe in incentives that give someone else's $ to their friends. You forget step 2.5: have sanctuary citiers that let illegals vote. I'm taking my company out of the state later this year. Too many fees, taxes, regulations, penalties for unwitting infractions, etc., etc. In other words, I'm tired of working to pay the pensions of make-work chair-sitters. No mas. I enlisted in te Service in 1964, while LBJ was braying about how we were going to stay at peace. Well, after three tours in the Southeat Asian War Games I got my Honorable Discharge and discovered that the State I'd been born in, California din't want me. So I drifted, ending up in Texas. That was forty+ years ago. Best thing I ever did. My sister is trapped in the gold rush country, she can't get enough for her little patch of land and her house to move to a comarable place elsewhere. and the taxes and rising prices are eating their pensions. California is set for another decade of miserable decline-much as Michigan went through over the last ten years. Denial WILL be rationalized - just like the last decade. For those who think Boeing can't leave, just let the unions vote for another strike: it might take them a couple of years, but they'll move everything down south; Georgia, Alabama, South Carolina, etc... As goes California, so goes the entire Left Coast.... get ready folks, the economic tsunami is coming..
California is Detroit on a state level. The people and society that built California have been pushed out and the vindictive, politically correct liberal government now steering things is determined to break anyone unfortunate enough to be slightly right of center or, frankly, white. It's all about groveling before grievance groups and pandering to them for the power to shake down whatever productive businesses remain in the state. I don't think people outside of California realize how effed up this place really is. It's going to get really ugly out here. kmg said - "The IPO of Facebook will restore California fiscal solvency for another 3 years. After that, shale oil discovery off of Monterrey will cause another boost." Eh, what? Are you being sarcastic? There's absolutely no way California will allow oil production of any kind off the coast. Much of California's policies are still dominated by rich, white liberals who live on the coast. They are isolated in their community bubbles and, besides the NIMBY factor re oil, they are completely delusional about California's economic realities. They have no personal experience with the many closed hospitals and collapsing society and infrastructure in the inland areas so, for them, such things don't exist. And of course, they don't oppose the economic devastation of illegal immigration because that would be "racist". California's headed all the way down and the rich, white libs (and spineless moderates) are going to steer it there no matter what. And when things hit rock bottom, they'll still be blaming the Republicans. The reason many people go to AZ is the proximity of the CA markets in LA and SD. Also, there are incentives for retirees in property tax and a few other areas. This allows for a lot of grandparents to be close to their grandchildren. Let them float off in the pacific, they voted for all the mess, Did you know they could have postponed cap n trade until unemployment went down. They refused it lmao they could have had their cake and eat it too. There ya go float off into the Pacific. Businesses also know that electricity is already very expensive in CA, and that the Global Warming Solutions Act will drive the price of it to the stratosphere. The Air Resources Board is staffed with power-hungry zealots, and they have almost no checks on their power. Come on down to TEXAS! NO State Income tax and a very conservative government. And, guess what? Many of those companies leaving Cal and NY have move to TEXAS. Another problem (or maybe it's the same problem: big government) is the redevelopment scam which is growing into a Godzilla. It's unreal that there is even a question about ending it, but in Sacto it's considered controversial. California's economy is only sustained by the tech industry, the heartland agricultural industry and the military industrial complex via Lockheed, ship building, etc. The unsustainable rent seeking by illegal aliens is bound to meet economic disaster as free handouts are easy to start but hard to stop. The real danger is that will Cali and NY take down the rest of the country with them? FWIW I see that happening in the next 3-5 years. All modern economies rely on abundant energy (cheap or not). Only domestic drilling and independence on foreign energy will save America. I will link to this piece from my Old Jarhead blog. In WWII Budapest, it is reported that the Nazis (doubtless to the approbation of their Islamic admirers) would line up Jews who were chained together on a bridge over the Danube. They would shoot the fortunate one on the end, who would fall into the river, dragging the others to their drowning deaths one by one. Companies can flee California, Illinois and the other disaster states, but the economy is so integrated that not only are all 50 (or is it 57?) states chained together, but the US economy is chained to other economies, eventually to Greece, Spain, Ireland, and the rest of the EU disaster states. It’s hard to see how their collapse doesn’t drag the rest of us into the abyss with them. I have argued this myself but I do not believe that it is exactly true. Those that do not support the majority but are stuck with its stupidity do not really 'deserve' the bad government that they get. Of course, I will argue that they deserve what they get if they do not ensure that they are protected by the stupid actions of the majority. In fact, if they are really smart they should thrive because they can make a safe bet that the majority will do what is easy and take advantage of that knowledge. There are a lot of good reasons CA prospers regardless. Location, Climate, Resources... I say let them go. As New York was CA is, "If you can make it here, you can make it anywhere!" And Making it here influences everywhere. I spent last weekend in the Mountains, drove across the desert into the city, had dinner watching the Sun set on the ocean. I then drove back home through the largest and most diversified agricultural areas in any one State, with opportunity and potential everywhere. Don't let the door hit you where the dog should have bit you. TX, oh yes, if you have to. Everywhere else good luck! Virgina and Utah? You'll need more then luck! Well, this is really embarrasing for California.